Academy Award nominee Reese Witherspoon (Mud) embarks on a journey of self-discovery in the 2014 biographical drama Wild, based on the best-selling book by Cheryl Strayed. 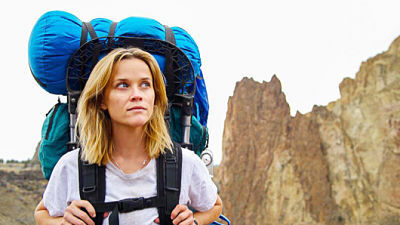 Reese Witherspoon hikes the Pacific Crest Trail in Wild. Wild recounts the reckless behavior of Cheryl Strayed (Witherspoon), who makes a rash decision to embark on a challenging trek across the Pacific Crest Trail. With absolutely no experience, she sets out to hike more some 1,100 miles all on her own — in what becomes an journey of transformation and redemption that strengthens and ultimately heals her. Directed by Jean-Marc Vallée (Dallas Buyers Club), the film co-stars Laura Dern (Blue Velvet), who is also an Academy Award nominee, shee for Best Supporting Actress. The outstandingly reviewed film has earned some $36 million at the domestic box office since its carefully platformed release to theaters in December, 2014. ● How Much Does A Monster Weigh?